Crickets. That’s not what you want to hear when you call a Realtor®, especially, after that Realtor® has just listed your home for sale. When you call someone for help it’s important for that someone to answer. A good Realtor® knows good communication isn’t just about returning phone calls; it’s about respect, valuing your time, listening and recognizing your needs and then walking you through solutions that meet your needs. A sit down, face-to-face conversation at the house to review home details and your expectations and needs for time and price to sell. Iris will perform a thorough analysis of the current market in your area and price evaluation. Iris will meet with you to discuss how best to position your home in the market in a way that meets your needs. Paperwork completion via email through DotLoop or meeting with paper and pen according to your convenience and preference. Your home is listed on the Multiple Listing Service and sent to you for review. Signage placed in yard with texting option for buyers. Your home is marketed across social media and online real estate channels. Centralized Showing Service setup to alert you of showing requests and feedback. Every two weeks a report is emailed to you with the current market position of your home and activity. Once under contract, you will be kept up-to-date as progress is made and detailed status until closing date. Iris and her team are available throughout the process to answer questions and provide resources to help get your home SOLD! A true professional wants to answer your phone call, is eager to help, and does what she says she will do. 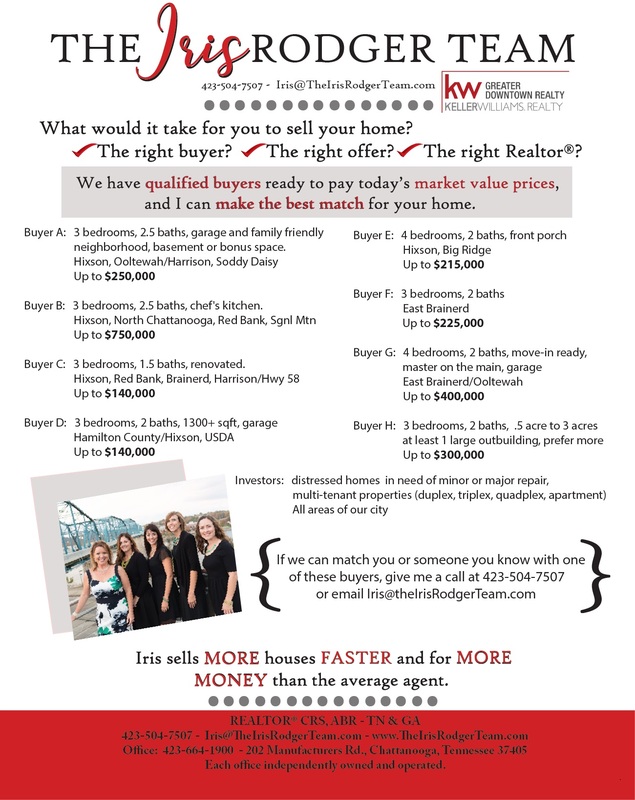 Iris will take every step of the selling process with you and for you. Save the crickets for quiet, summer evenings relaxing on your new back deck.